I like the name of the award, though. 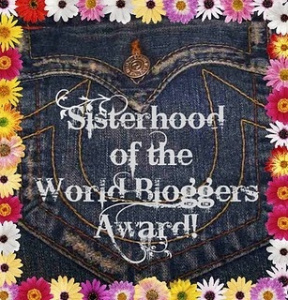 Sisterhood of the world bloggers award. Say that five times fast (without spitting all over your computer). There are these rules and since I don’t know what I’m doing, I’m just going to follow the rules! I’m such a rebel. First of all, thank you Asil Acasio from RedefiningRandom for nominating me! You’re the awesomest twelve year old I know! ( I don’t know that many twelve year olds, but that’s beside the point!) I would also like to apologize for all my swearing. I should probably have started with the rules… Oops. Rule number two: Answer the questions. Rule number three: Put the award logo in your post. Check! Rule number four: Nominate seven blogs. In one word, how would your readers describe your blog? Only one word? Are you serious?!? Uhmm… Supercalifragilisticexpialidocious! Ha, I win! I love all my babies equally. But seriously ThoughtfulThursday #1! Because that post makes me feel better. What, who inspires most of your blog posts? My inner voice. She’s the true genius! What do you inspire to accomplish this year? I don’t know. Is this just some elaborate scam my family created to get me to do things? Let’s just say I think I’ve had a pretty good day when I get myself out of bed. That’s an accomplishment right there! Absolutely nothing. No, that’s not true. I want to learn how to clone myself, so I don’t have to get out of bed! Uhm. This is impossible to answer. I’ll read anything that has words in it. If I had to pick one book? My brain hurts… I just don’t know. Crawling through a pitch black cave in the Ardennes. That was some serious trust exercise. Influencing other people’s minds, like professor X. I just want to know how weird and crazy people really are, because our brains can do some pretty messed up stuff! Is this the part where I’m supposed to say my mom? Yeah, it is right? Thanks for the nomination Charlotte! I love your answers, especially the one regarding your favorite book! LOL! Wow! You actually nominated me?! I didnt think anyone read my blogs but me, and I dont even read my blogs… I lead a lonely life. Oh well. Thank you! Thoroughly enjoyed reading through your questions too, I am also working on a get out of bed clone, perhaps we can team together and come up with a solution. Failing all else we can just paint each others eyelids with eyeballs so people think we are awake! I feel like I’m getting carried away… Thank you Charlotte!